Dumore Series 28 automatic feed drills, or self feed drills, are available in cost saving kits designed to meet the most common applications and installations. For both drilling and tapping applications. Includes the automatic feed drill & tapping unit, reversing drill & tapping motor and tapping control panel. 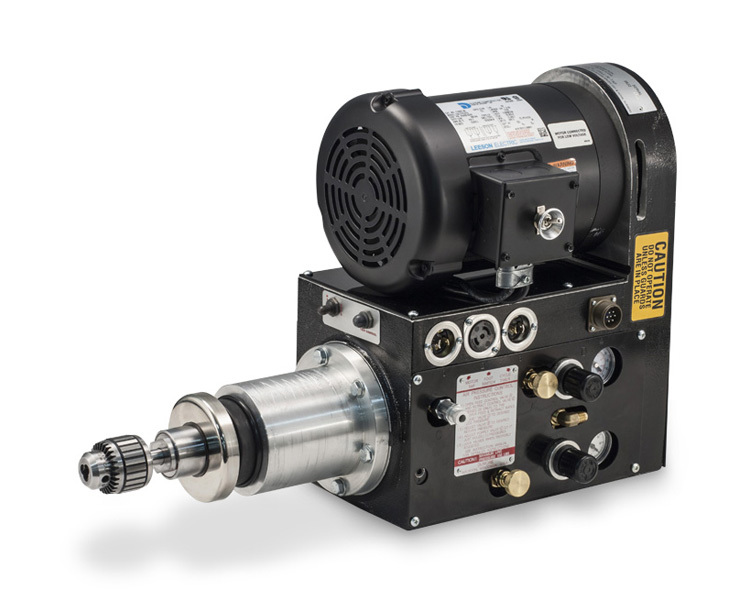 The motor automatically reverses for withdrawal after tapping, up to 16 cycles per minute. For drilling applications. Includes the automatic feed drill & tapping unit, non-reversing drill motor (choose either the single phase or 3-phase option) and hydraulic feed control. For vertical drilling applications. Includes the automatic feed drill & tapping unit, non-reversing drill motor (choose either the single phase or 3-phase option), hydraulic feed control and vertical mounting hardware. Series 28 automatic feed drills and tappers have a drilling capacity of 3/8" diameter (mild steel), tapping capacity of 1/2" diameter (mild steel), and are capable of drilling and tapping class 2 threads ranging from 4-40 to 1/2-13 threads per inch. These self feed drills accept multiple spindle drill heads and have a low air consumption requirement of 5 scfm or less. No mechanical parts – gears, clutches or lead screws – are required, eliminating the major cause of problems in ordinary tapping machines.